Rennet-induced milk gels are relatively stable if left undisturbed. However, if the gel is cut, broken or exposed to pressure, the para-casein matrix contracts on itself expressing its aqueous phase (as whey) in a process known as syneresis. Controlling syneresis is the key to cheesemaking as it allows the cheesemaker to control moisture which, in turn, largely determines the quality, ripening and stability of the cheese. After the gel has formed, it is subjected to various treatments (cutting, cooking, stirring, acidification, pressing...) to encourage the expulsion of whey. 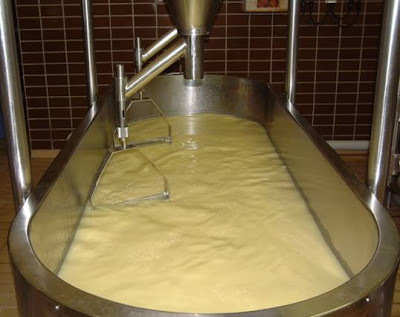 In hard cheeses such as Swiss and Cheddar syneresis occurs mainly in the vat while the gel for soft (high moisture) varieties such as Camembert may be scooped directly into moulds where whey expulsion is driven mainly by the decrease in pH. Perhaps surprisingly for such an important parameter, methodology for measuring synersis is relatively poor. Approaches used have included measuring the volume of whey produced or the volume, moisture content or conductivity of the curd. Tracer/marker methods have also been used and some authors mimic the cheesemaking protocol (e.g., addition of starter, cooking) when measuring syneresis. However, all methods have inherent drawbacks.